The perfect way to clip ID cards (badges) to anything - shirts, belt loops, collars, cuffs or purses. Safe - no more pinholes or rips in your belongings. 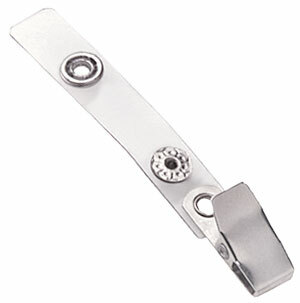 Nickel plated steel (NPS) with 2-3/4" (70mm) clear vynil strap. 2105-2011 = NPS Clip & "Narrow Middle"